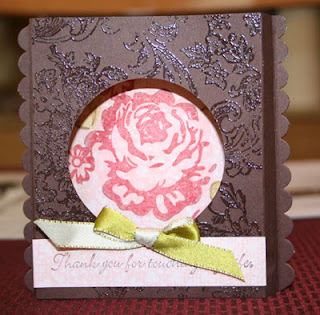 I love roses and love the new Bella Rose series of products and especially this new A Rose is a Rose stamp set. Chocolate chip and the new Pink Pirouette is a favorite color combination of mine, and the Kiwi Kiss satin ribbon is the perfect finish. Cut one piece of 5-1/2 x 4-1/4 Chocolate Chip and one of the pink patterned paper from the Bella Rose designer series pack. Using my Creative Memories circle cutting system, I cut a whole in the middle of the Chocolate Chip piece of cardstock. First I stamped the rose, solid image in pink although it can hardly be seen. Then stamped the accent, highlighted image for the rose in red and rock-n-rolled (http://www.stampinup.com/us/enu/4290.asp) it in Chocolate Chip (although you can hardly see it). I did the same color combination for the smaller roses. For the leaves, I used Kiwi Kiss and the stamp-off technique (where for the solid image, I stamp it in ink, stamp-off on a scrap piece of paper, then stamp the real card stock leaving a faded image in green. Then the highlighted/accented stamp for leaves was stamped regularly). To finish the card I taped the sides together and then used the Scallop Edge border punch on each end. Tie a bow with Kiwi Kiss satin ribbon and adhere with Mini Glue Dot at the bottom of the circle, and add a greeting to the front if desired. 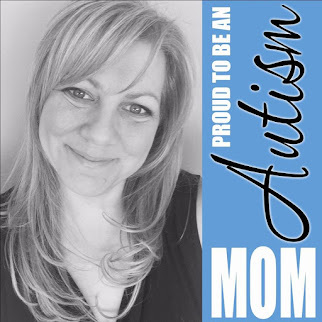 Another beautiful card Heather! I've been resisting the Rose is a Rose set, but I think you have finally cracked my resistance! Have a wonderful day!